The five gubernatorial candidates outline how they would shape tax policy if they were to be elected. 1. Would you consider raising taxes if we have a massive budget drop like we’ve had twice in the last decade? Why or why not? Under what circumstances would you consider raising taxes? I’ve said repeatedly that I will not raise taxes, the Attorney General will. I do see great opportunity to make reforms to our tax code, making it simpler, fairer and removing corporate loopholes. I also believe we need to be responsible about building up our rainy day fund (and not spending it in good economic times) so that we are prepared for tough times. 2. In your last campaign, you supported lowering the income, sales, and corporate tax rates to 5 percent. Why do you no longer support that plan? Massachusetts is facing a different set of economic realities with the national economy on the rebound. My mission will be to improve life across Massachusetts, including communities and geographies that are seeing a slower economic recovery. Lower and fairer taxes are an important part of creating jobs and accomplishing that goal. 3. In your last campaign, you signed a no-new-taxes pledge. Why have you not signed the pledge this time? Background: See response to q1 re: reforming tax code. 4. Are there tax expenditures you would end? Please be specific. I would eliminate the inventory tax which is unique to Massachusetts and discourage investment in job creation. 5. Do you support the film tax credit? What about the tax credits for Raytheon and Fidelity? Why or why not? I see a role for targeted tax credits on a short term basis, but only when we can link them directly to job creation and economic benefit for the Commonwealth. 6. Where do you stand on the ballot question to eliminate the indexing of the gas tax? Why? 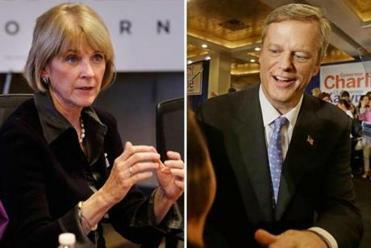 Gubernatorial candidates Charlie Baker and Martha Coakley are treading cautiously when it comes to the charged issue. I oppose indexing gas tax hikes to inflation. If the legislature wants to raise taxes on those least able to afford it, they should be required to take a public position by casting their votes. This lack of transparency is a hallmark of the status quo on Beacon Hill that I intend to change. 7. Do you support rolling the income tax back to 5 percent, in line with the voter-passed ballot question in 2000? Why or why not? Would you commit to doing immediately upon taking office? I support upholding the will of the voters by rolling the income tax back to 5% as quickly as possible. 8. Are there any taxes you think are too high and should be cut? Please be specific. 9. Are there any taxes you think are too low? Please be specific. 10. Would you favor raising the personal exemption? Why or why not? I am open to that as part of reforming our tax code to make it simpler and fairer. 11. Do you support the 2002 state law that automatically reduces the income tax rate when revenues grow according to a formula, essentially guaranteeing minor tax cuts when the economy is healthy? Why or why not? 12. Would you support a Constitutional amendment for a graduated income tax? Why or why not? I oppose. The electorate has rejected a graduated income tax time and time again. Voters have said clearly that they do not want their taxes raised as the Attorney General has proposed. 1. Would you consider raising taxes if we have a massive budget drop circumstance? Martha’s first priority is to make the kinds of investments that will grow our economy, provide new revenue, and allow state government to deliver the services that our residents need without raising taxes. However, Martha would not rule out raising new revenue if not doing so would negatively impact our public schools, our investments in economic growth and health care, and our ability to maintain safe roads, bridges and public transit. In that situation, I would look to revenue options that do not increase the burden on those in the middle class and those who can least afford it. Martha has said that she is open to considering a constitutional amendment for a graduated income tax, as long as it doesn’t raise taxes on middle and low income families, but she also knows that it would likely take a while to get there. She is focused on creating a tax system in Massachusetts that is fair for working families while still allowing us to invest in our shared priorities. 2. You’ve proposed some significant programs – such as an extended school day and such and universal pre-K. How would you pay for them? Martha believes our first priority for growing state revenue should be growing our state economy and creating good-paying jobs in every part of the state. Martha has a plan to grow our regional economies that will invest $500M over the next 10-years. Mayors across Massachusetts have reviewed the plan and believe that it will spur economic growth and create jobs in every region. Martha knows we also need to examine how our state currently allocates its resources, in order to determine if we are addressing our priorities as cost-effectively as possible and, along with that, identify areas where significant cost savings can be achieved. Specific areas she would look for savings include how the state manages and pays for health care, and providing more rehabilitation services to prevent additional costs in our criminal justice system. Finally, as described above, if the state is in a situation where it is necessary to raise new revenue to support our investments in our public schools, economic growth, and our roads, bridges and public transit, we need to be sure to do it transparently, make the case directly to the people of Massachusetts, and to do so in a manner that does not increase the burden on working families. 3. Are there tax expenditures you would end? Please be specific. Martha is committed to a comprehensive review of our tax expenditure budget, to ensure that every expenditure is returning commensurate value to the Commonwealth. She would also make sure credits get reviewed on a regular basis to make sure they are still effective. 4. Do you support the film tax credit? What about the tax credits for Raytheon and Fidelity? Why or why not? Martha supports tax credits that keep good companies and good jobs in Massachusetts, and promote investment in our Commonwealth. However, she has said that she will review all of our tax expenditures to ensure that they are returning meaningful benefits to the people of Massachusetts, and she believes that should include claw back provisions so that the state can recoup the cost of the tax credit if companies fail to reach agreed upon job creation targets. Martha supports the film tax credit because she believes it has led to more movies being filmed in Massachusetts, which has helped generate economic activity and jobs for people in the state. 5. Where do you stand on the ballot question to eliminate the indexing of the gas tax? Why? Martha supports the indexing provision recently passed by the legislature because it is critical to funding needed repairs and improvements to our transportation infrastructure, much of which is crumbling after decades of underinvestment. Business leaders, chambers of commerce, and taxpayer organizations all agree with Martha on this issue, and understand that these investments in infrastructure will help support our economy and create jobs in every region of the state. Massachusetts is still suffering from the tricks and gimmicks used by Charlie Baker to hide the true cost of the Big Dig, and the investments that we can make by indexing the gas tax will allow us to address those issues, fix and maintain our roads, bridges and public transit, and bring some regional equity by investing in projects in the south coast and western Massachusetts. 6. Do you support rolling the income tax back to 5 percent, in line with the voter-passed ballot question in 2000? Why or why not? Would you commit to doing so immediately upon taking office? Martha supports the current law, which would roll the income tax back to 5 percent as long as certain economic growth triggers are met. She would not change the current law and roll it back immediately upon taking office because it could have a negative impact on our commitment to public education, economic growth, and investments in infrastructure. Gradually reducing Massachusetts’ income tax as the economy improves is a way to give working families a boost, no matter how small, in an economy where every extra dollar still counts. In addition, this system incentivizes the importance of building an economy that works for everyone, so that we can responsibly reduce taxes while simultaneously increasing state revenue. 7. Are there any taxes you think are too high and should be cut? Please be specific. Martha believes that property taxes are too high and a particular burden on seniors, many of whom are living on fixed incomes. 8. Are there any taxes you think are too low? Please be specific. Martha’s first priority is to make the kinds of investments that will grow our economy, provide new revenue, and allow state government to deliver the services that our residents need without raising taxes. 9. Would you favor raising the personal exemption? Why or why not? Martha would consider raising the personal exemption — as part of a review of all of our tax expenditures — particularly since families have been hit so hard after Wall Street busted our economy. 10. Do you support the 2002 state law that automatically reduces the income tax rate when revenues grow according to a formula, essentially guaranteeing minor tax cuts when the economy is healthy? Why or why not? Yes. Gradually reducing Massachusetts’ income tax as the economy improves is a way to give working families a boost, no matter how small, in an economy where every extra dollar still counts. In addition, this system incentivizes the importance of building an economy that works for everyone, so that we can responsibly reduce taxes while simultaneously increasing state revenue. 11. Would you support a Constitutional amendment for a graduated income tax? Why or why not? Martha has said that she is open to considering a constitutional amendment for a graduated income tax, but she also knows that it would likely take a while to get there. She is focused on creating a tax system in Massachusetts that is fair for working families while still allowing us to invest in our shared priorities. 1. Would you consider raising taxes if we have a massive budget drop like we’ve had twice in the last decade? Why or why not? Under what circumstances, would you consider raising taxes? I’m willing to consider any tax policy that maintains or improves our fiscal health and security. In the event of a major financial crisis like the one we experienced in 2008, government has an important role to play to ensure there is sufficient economic activity to stave off an even more serious crisis. skirt this fact is just not being candid with voters. Period. So rather than remaining stuck in the outdated Left versus Right, “higher taxes versus lower taxes” debate, it is time to do a thorough, line-by-line review of our state budget, and reallocate spending to those needed priorities. We have a huge opportunity here to move away from “the way we’ve always done things” and to a fiscally pragmatic, common-sense approach that funds what people actually need. If we take the time to very openly make the case to people about where, when and why their tax dollars are being spent, I believe we can move to a mindset that’s a lot more practical and clear. 2. Are there tax expenditures you would end? Please be specific. I would call for cutting the multi-million-dollar tax breaks our state government has been providing to corporations – some of which wind up closing their businesses here anyway. Instead, those taxpayer dollars should be going to a combination of much-needed areas like homes and health care for our veterans in Massachusetts, quality education, job training initiatives for workers of all ages, wellness programs for our senior citizens – or right back into taxpayers’ pockets. 3. Do you support the film tax credit? What about the tax credits for Raytheon and Fidelity? Why or why not? Not all tax credits are equal. I believe tax credits should be judged on how well they align the public’s interests with those of the private sector, so we can leverage private spending for the public good. Historic preservation tax credits and brownfields tax credits are good examples of this kind of policy. For this reason I support the film tax credit. The reality of modern film and television production is that the existence of tax credits is a material factor in determining where to produce a film or television show. Massachusetts gains these film and television productions, and the economic benefits of them, because of these tax credits. Tax credits to other kinds of businesses, like the ones mentioned, are more problematic. Businesses locate their operations and employees in the places where the core business fundamentals are best. The tax breaks provided to those multi-billion dollar corporations represent a windfall to those businesses, which, given the size of the tax breaks, are going to locate their jobs here (or not) for more fundamental business reasons. In my own business experience, the significantly higher costs for employees in Massachusetts (driven by our excessively high cost of living and health care costs) were the most significant factors in deciding where to hire people. The excellent pool of talent in Massachusetts still made this a compelling place to hire people, but these excessive costs – which are not addressed through tax breaks – are what must be tackled to support real, sustained growth. Finally, we must change the outdated mindset that says that the best way to grow jobs is to give away large tax breaks to large companies. The modern economy is driven by the growth of small- and medium-sized businesses, and government policy must be focused on reducing the cost of living, which will best help fuel their growth. 4. Where do you stand on the ballot question to eliminate the indexing of the gas tax? Why? I am against the repeal of the indexing of the gas tax to inflation. The sales tax and income tax are also “indexed” to inflation, since they are charged as a percentage of the amount subject to tax. The gas tax is collected as a fixed number of cents, which means that indexing it to inflation makes it function as if it were a percentage. No one likes to pay taxes, but having them align with inflation is just common sense. Meanwhile, an important point must not be lost: the gas tax is needed to start to pay for the years of neglect and deferred maintenance of our roads, bridges, public transit and other infrastructure that everyone relies on in Massachusetts. For example, there are well over 400 structurally deficient roads and bridges in Massachusetts. It is the responsibility of state government to shrewdly and accountably spend these tax dollars, and voters must hold candidates and lawmakers to account for providing a clear, coherent, organized vision of how this will happen. 5. Do you support rolling the income tax back to 5 percent, in line with the voter-passed ballot question in 2000? Why or why not? Would you commit to doing so immediately upon taking office? Provided we continue our post-recession economic recovery, I support the gradual reduction in rates to 5% based on the 2002 law tying these reductions to improved tax collections. 6. Are there any taxes you think are too high and should be cut? Yes. There should be a lower tax rate for small businesses (which I propose should be pegged at 25% less than those paid by large businesses). This can be paid for by a reduction or elimination of big tax breaks given to large corporations. In addition, we must expand the property tax “circuit breaker” program to support individuals and families – particularly seniors – not having to have to choose between selling their home or paying their property tax. 7. Are there any taxes you think are too low and should be raised? When and if the federal government approves it, the state should collect sales tax on online purchases. In addition, I support an excise tax on certain luxury items like yachts and very high-end, luxury automobiles. We should also install tolls at state border crossings, so that people entering Massachusetts from out of state support the cost of maintaining our infrastructure. 8. Would you favor raising the personal exemption? Why or why not? Yes. State taxes in Massachusetts are generally regressive. Raising the personal exemption helps ensure individuals and families can keep more money in their pockets, which helps offset the rising cost of living in our state. Tackling the problem of the high cost of living would do more to help those families than increasing the personal exemption. 9. Do you support the 2002 state law that automatically reduces the income tax rate when revenues grow according to a formula, essentially guaranteeing minor tax cuts when the economy is healthy? Why or why not? Some say the legislature should not raise taxes without a vote – they should be asked if they also support the legislature cutting taxes without a vote. I support the 2002 law not because it will solve the problem, but because it is at least a small part of easing the burden on families and individuals from the excessively high cost of living in our state. 10. Would you support a Constitutional amendment for a graduated income tax? Why or why not? Yes. The nearly 100-year-old provision of our state constitution requiring a flat tax is outdated and impedes efforts to develop a modern tax code, designed to maximize economic growth and opportunity. A tax code fundamentally based on ideas from the early 20th century does not fit the realities of a 21st century economy. 11. Do you have any other specific plans for taxes you would like to share? I am calling for the establishment of a Tax Modernization Commission. The job of this commission is to convene experts in tax policy to design a tax code for Massachusetts that is modern and serves as a foundation for fairly funding government and supporting free enterprise and economic opportunity. It is time to end the tired old debate of “high taxes versus low taxes” and move forward to answer the question – when it comes to smart, sensible tax policy, what are we capable of? 1. Building up the Massachusetts Stabilization Fund (Rainy Day Fund) to the highest level allowed by statue. 2. Not using the Rainy Day Fund as a budget gap filling tool in stable fiscal times. The time to use the Rainy Day Fund is when it is raining. 3. Driving efficiencies in state government and transferring these savings to invest in areas like early childhood education and transportation. I believe all tax expenditures should be examined in an overall effort to simplify the state’s tax code. For instance, the exemption of payments made to coal miners is currently on the books of the Commonwealth. Massachusetts is not a coal producing state. We need to re-examine how many people and businesses these expenditures affect and if they need to be eliminated. My administration will protect taxpayer dollars to benefit the Commonwealth as part of a long term strategy. I support the film tax credit and tax credits for Raytheon and Fidelity. We have seen how the film tax credit has brought major motion pictures to the Commonwealth. I do, however, think we need to take a look at implementing residency requirements for vendors and crew so these credits go to Massachusetts based companies. I support tax credits for Raytheon and Fidelity. According to a 2010 report by the UMass Donahue institute, the defense industry in Massachusetts contributes over $16 billion in annual federal contracts and supports over 115,000 jobs. We need to encourage companies like Raytheon to remain in the Commonwealth. Fidelity and financial services also support over 180,000 jobs in Massachusetts. We need to realize that this is a global economy and that these companies can move anywhere. Fidelity has been a longtime corporation in Massachusetts and we need to encourage these companies to stay here. Finally, each of these tax credits, as with all tax credits, need to have claw back provisions so the state is protected from corporations not delivering on what they have promised. I support the ballot question eliminating the indexing the gas tax to inflation. Too many times government puts laws on the books that they never revisit. Legislators have a responsibility to their constituents to show leadership and vote for tax increases as they deem them necessary. Indexing abdicates that responsibility and taxpayers’ dollars should not be managed passively. 5. Do you support rolling the income tax back to 5 percent, in line with the voter-passed ballot question in 2000? Why or why not? Would you commit to doing immediately upon taking office? I have clearly stated that I support rolling the income tax back to 5% as the voters passed in 2000. As Governor, I will support the will of the people when it comes to ballot initiatives and their voices being heard the ballot box. I will not commit to reducing it to 5% immediately because I believe that is irresponsible. Through efficiencies, attrition, and adopting technologies throughout state government to save money, my administration will commit to reducing the income tax to 5% by the end of my first term. My administration will eliminate the inventory tax for businesses. We are one of nine states who still have this tax. If we can bring large distribution centers to the Commonwealth, particularly with our location in central New England with access to 5 ports and major interstate highways, this will create jobs across the Commonwealth. I support raising the personal exemption for individuals and married couples. People work hard for their money and they should be able to keep more of what they earn. By raising the exemption from $4,400 to $5,000 for individuals, and to $10,000 for couples, some people will see a benefit on their tax returns. Wages have been stagnant for decades so we should allow for people to keep more of their money. Yes I support reducing the income tax when the economy is healthy. When we have a healthy economy with low unemployment, higher revenues, and economic prosperity, people should be able to keep more of what they earn. A large portion of our national economy is based on consumer spending. When people have more money to spend you have an economy that continues to grow. I do not support a graduated state income tax. We should increase the personal exemption, increase the earned income tax credit for lower wage workers, and maintain exemptions on food and clothing allowing for a fair tax structure and protecting our most vulnerable. No. Massachusetts is 129 billion dollars in debt. Not because of lack of revenue, but because we lack fiscal discipline. We need to get our financial house in order and that means shrinking, not enlarging our government. I would work to downsize and streamline the government, devoting half of the savings to paying off debt and giving the other half back to the taxpayers. I can’t conceive of any situation outside of the most extreme emergency that would justify tax increases in Massachusetts. I would end all taxpayer funding in support of abortion and homosexuality. I do not support tax credits for a few favored multi-national corporations, nor for Hollywood. This sort of piecemeal tax policy breeds cronyism. Instead, lets lower the corporate tax rate across the board and restore the business-friendly climate we had several decades ago before the tax-and-spend liberals took over the commonwealth. I do not support indexing of the gas tax. Tax increases must be voted on by the people who have to pay them. They should never go up automatically. I would roll the income tax back to 5% during my term of office as part of a restructuring package to downsize and streamline government. 6. Are there any taxes you think are too high and should be cut?Please be specific. I would keep the promise made by government back in the 70s that it would stop collecting tolls on our roads once they were paid for. I would stop the tolls and remove the toll booths. This would have the added benefit of easing traffic congestion. 7. Are there any taxes you think are too low and should be raised? Please be specific. I would initiate the taxation and mandatory labeling of genetically-modified foods (GMOs). Yes. If the goal is keeping more money in the pockets of the taxpayers we can accomplish that most efficiently by not taking it from them in the first place. Yes. It’s our money. Whenever we can achieve efficiency in government we should all benefit by tax reductions. No. The last thing we need is more socialism and more bureaucracy in our system. I would support tax incentives and reasonable environmental deregulation to revive rural family farms and urban manufacturing, both under local control.